Alexandra Raij, Eder Montero, Rebecca Flint Marx, "The Basque Book: A Love Letter in Recipes from the Kitchen of Txikito"
Chefs Alexandra Raij and Eder Montero are masters of this art form, and their New York City restaurant Txikito is renowned for its revelatory preparations of simple ingredients. In this much-anticipated and deeply personal debut, Raij and Montero share more than one hundred recipes from Txikito—all inspired by the home cooking traditions of the Basque Country—that will change the way you cook. Dishes like Salt Cod in Pil Pil sauce have fewer than five ingredients yet will astonish you with their deeply layered textures and elegant flavors. 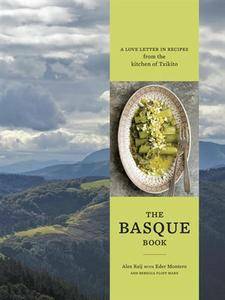 By following Raij’s careful but encouraging instructions, you can even master Squid in Its Own Ink—a rite of passage for Basque home cooks, and another dish that will amaze you with its richness and complexity.